Six years later, mother’s ‘Chicks with Sticks’ program still delivers hundreds of warm hats to IDF soldiers facing the winter cold. Six years ago, Channah Kopel of Efrat suggested that her local knitting group make hats for IDF soldiers. At the time, her son was a soldier stationed in the Golan, one of the coldest places in the country. Today, the knitting group’s idea has spread around the globe, with knitters from as far away as California, Alaska and New Zealand pitching in to keep Israel’s soldiers warm through the winter. It was Koppel’s idea to spread the project beyond Efrat’s borders. When the local knitting group found itself with hundreds of requests for warm hats each week, Koppel began Chicks with Sticks, a project to involve supporters across the country in creating hats. The local post office keeps a separate package list for her, in order to keep track of the roughly 100 deliveries per week to her address. 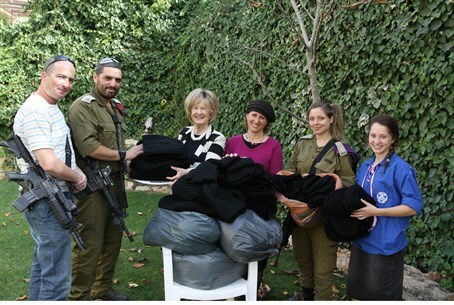 This week, as temperatures dropped, Koppel and her fellow volunteers were there to give 300 soldiers warm woolen hats. Koppel noted that her family and community have all pitched in to help: the region’s security coordinator puts soldiers in touch with local knitters, her mother-in-law knits the tags into the hat, and her mother, who made Aliyah (immigrated) from Canada last year, remains in touch with knitters in Canada and continues to get new volunteers involved in the project.